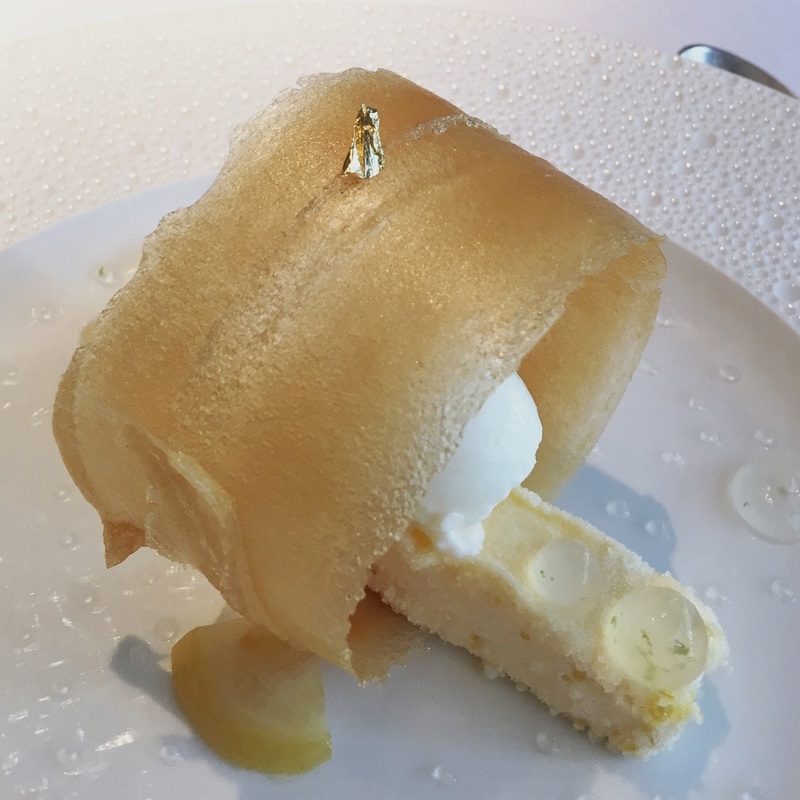 I have been itching to complete this second part of my Restaurant Gordon Ramsay review to share the amazingness that was the entire 9 courses, and so am grateful for a rainy morning in Lake Como to sit and write, finally! Its been two weeks since the most incredibly extravagant food experience of our lives. And reliving each course for the purposes of this post has brought each delectable morsel back to me. It was that good. 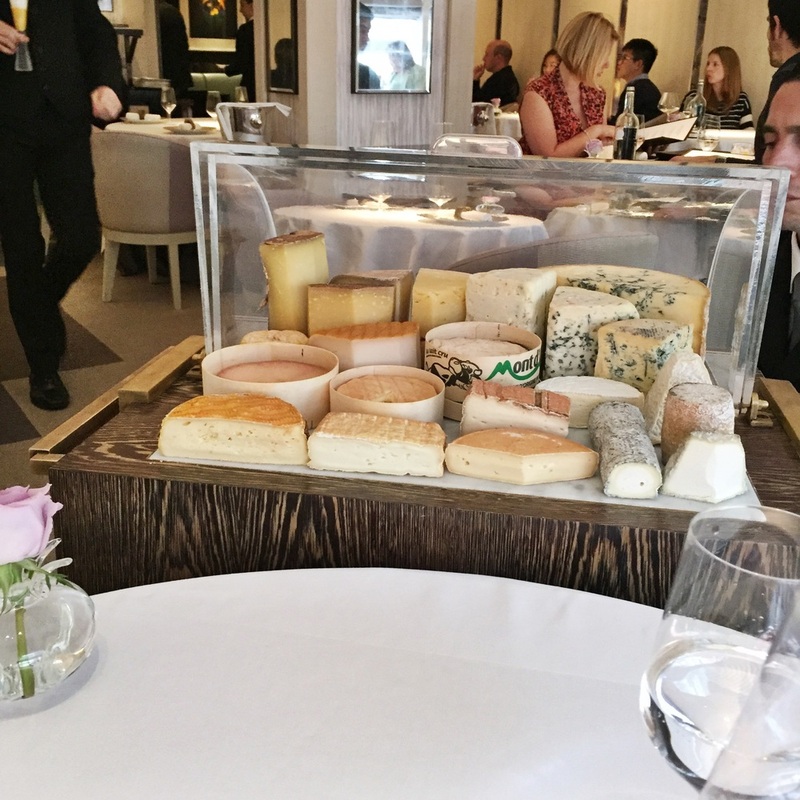 We've gushed to anyone who would listen (and a few who had no choice in the matter) about our lunch at Restaurant Gordon Ramsay, but now I'm going to show you what all the fuss has been about! I posted a general review two weeks ago, but today it is time to talk about the FOOD!! We chose the 7 course Menu Prestige, because, well, we've always kind of taken the approach in life that if we're going to do something, we're going to do it right. 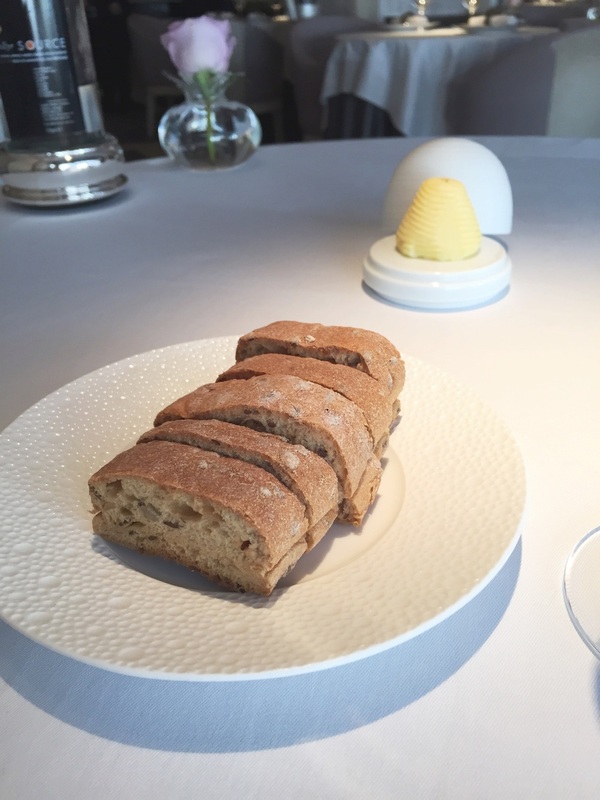 I saw that if I was going to have the opportunity to eat at Gordon's 3 Michelin star restaurant, I was not going to be half-assed about it, I'm eating as much as humanly possible. 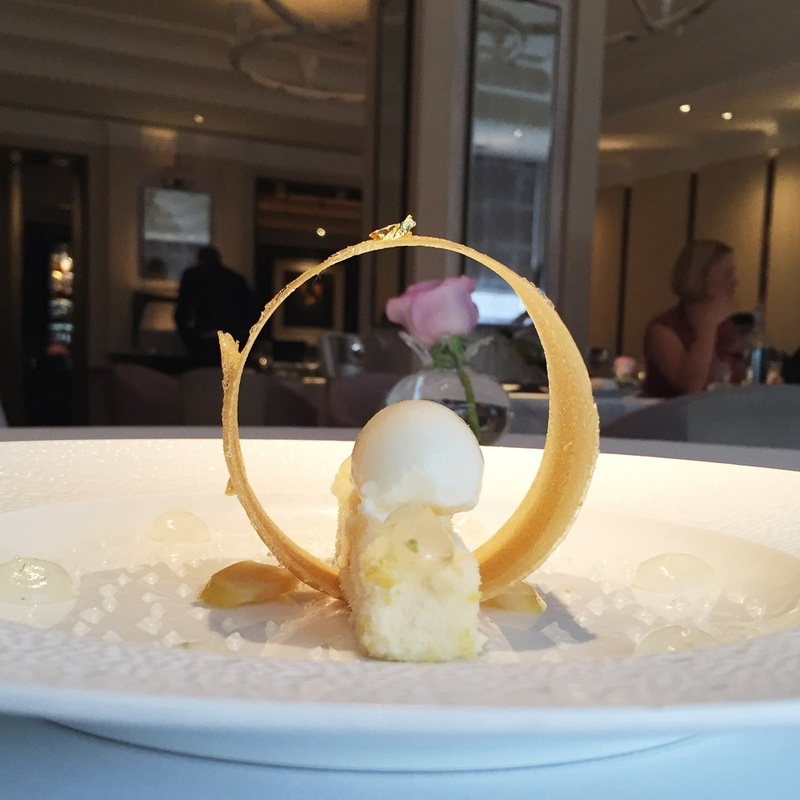 And Chef Patron Clare Smyth not only met, but exceeded my high expectations! This right here is my own personal menu to take with me from Restaurant Gordon Ramsay. Being a wee bit special (read: difficult) with my gluten intolerance meant that there had to be a few minor tweaks to the menu. And because the staff were beyond incredible, they decided to send me home with an accurate representation of my experience to help me out when it came time to write about each mouthful. My own mini loaf of gluten free bread, with handmade salted butter. Our very first course was one that was not on the menu, but rather was a gift from the chef. My favourite kind of gift, thank you Chef!!! 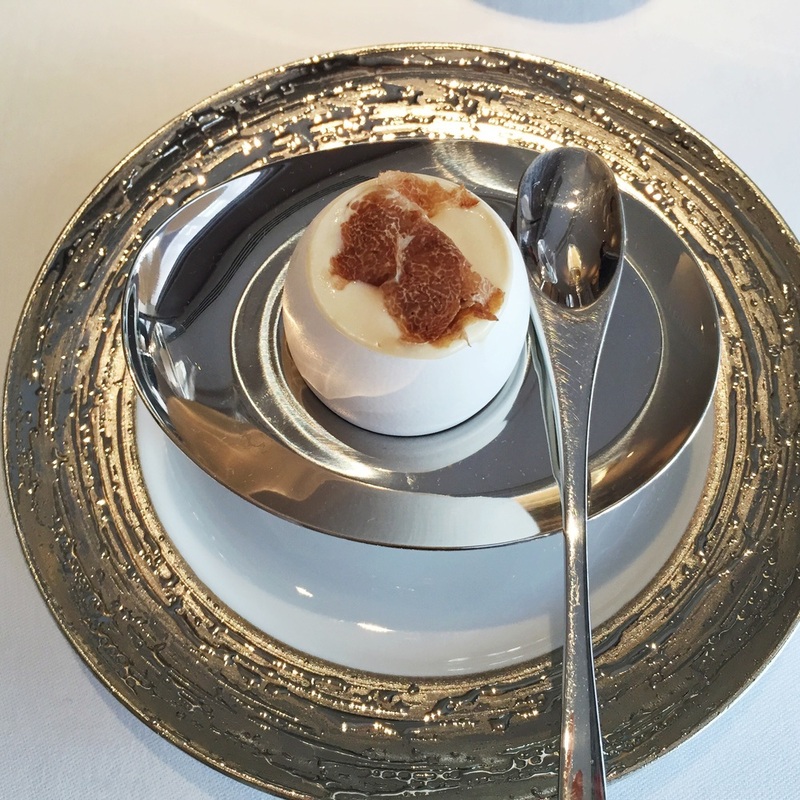 This was a potato mousse with smoked egg yolk and shaved black truffles. Served in an egg shell, of course. The flavours were so unique but the mousse was incredibly rich so the portion size was perfect. 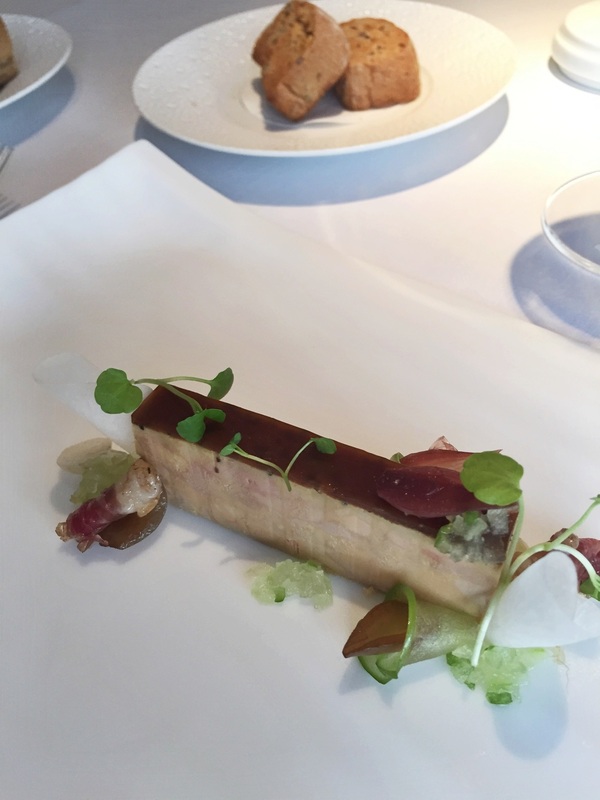 The first course from the Menu Prestige was the pressed foie gras, with green apples, turnips, watercress and smoked duck. I don't think I have ever had foie gras before, so have nothing to compare this to, but it was so creamy and the smoked duck was amazing. The next dish from the menu is the Restaurant Gordon Ramsay signature dish that has been on the menu since the restaurant opened in 1998. 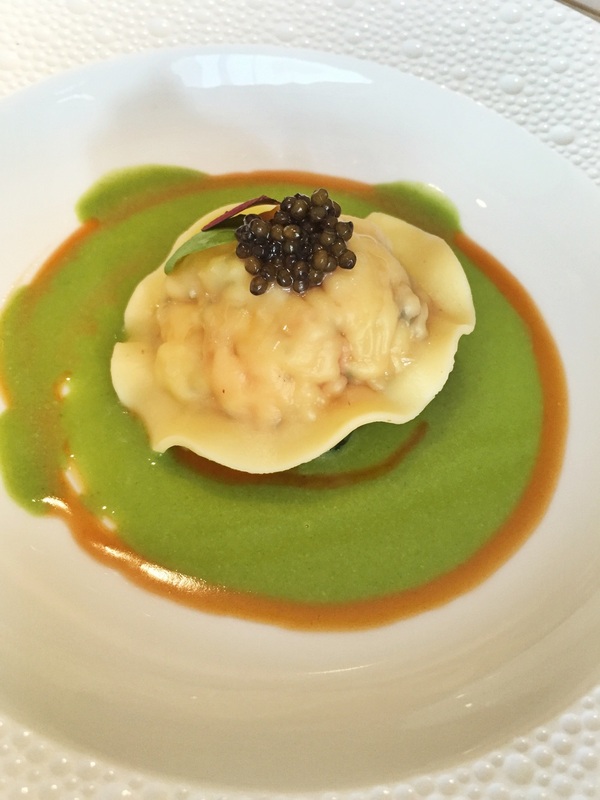 It is the ravioli of lobster, langoustine and salmon poached in a light bisque, oscietra caviar and sorrel veloute. Pete said it was incredible. And could have eaten ten of them. 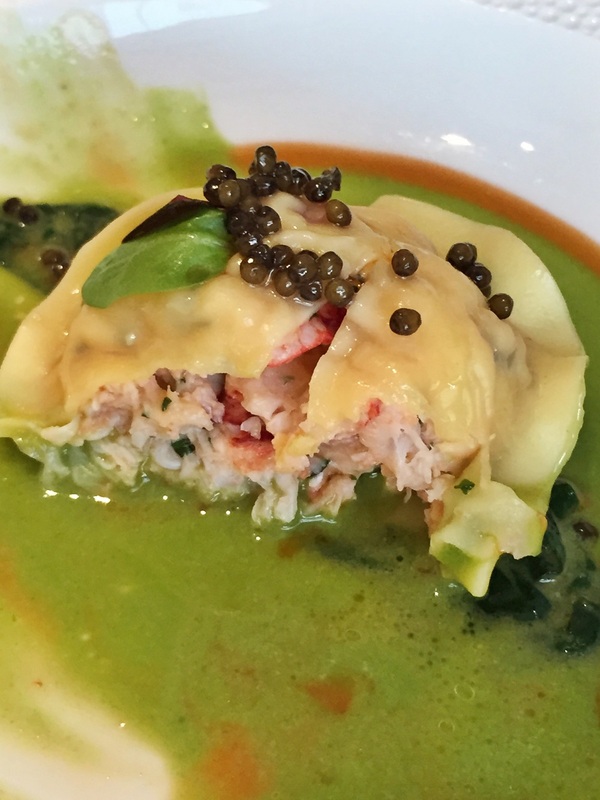 The spotlight was on the seafood, not the pasta, and it was his first time enjoying caviar. As a replacement for the ravioli, I was served pan-fried scallops, with heritage apples, walnuts, celery and cider emulsion. Not a bad replacement if you ask me. The scallops were cooked to perfection and the sauces were ridiculous! It was like a deconstructed scallop waldorf salad! But amped up a little! The walnut and apple purees were perfection, and were a sweet complimented to the scallops. 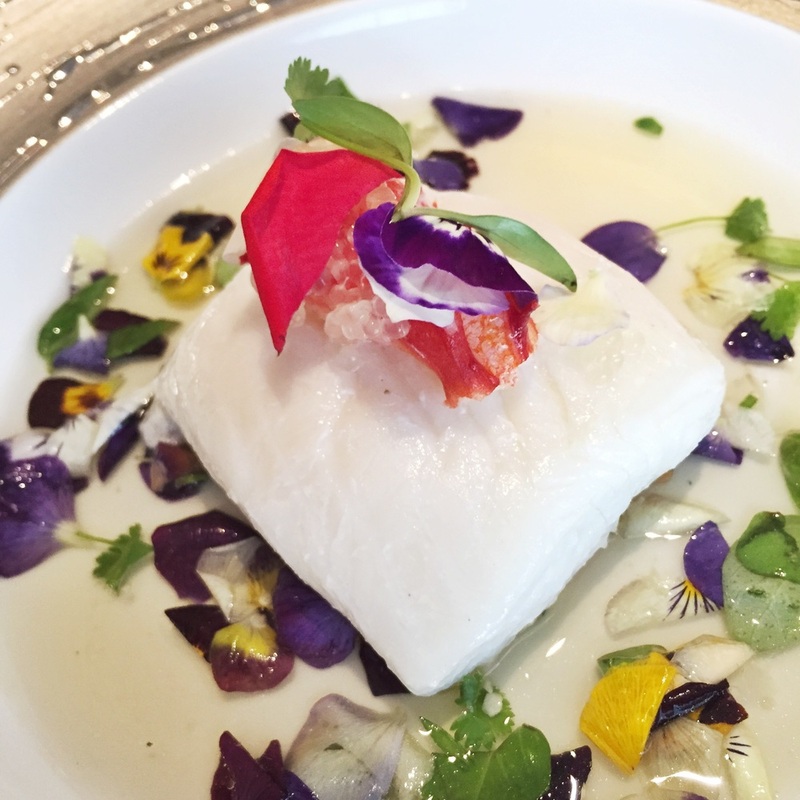 Next we had the poached halibut, with king crab, finger lime and ras el hanout infused broth. The ras el hanout is apparently a spice mix from North Africa, and is thought to be a combination of the best spices on offer. The halibut was so tender, it just fell away under our forks. But the standout had to be edible flowers. The aroma on its own was heavenly. The perfume that the broth gave to the fish was delicate and sweet. The halibut was sitting on a bed of cauliflower couscous which was fluffy and light, and went beautifully with the dish. 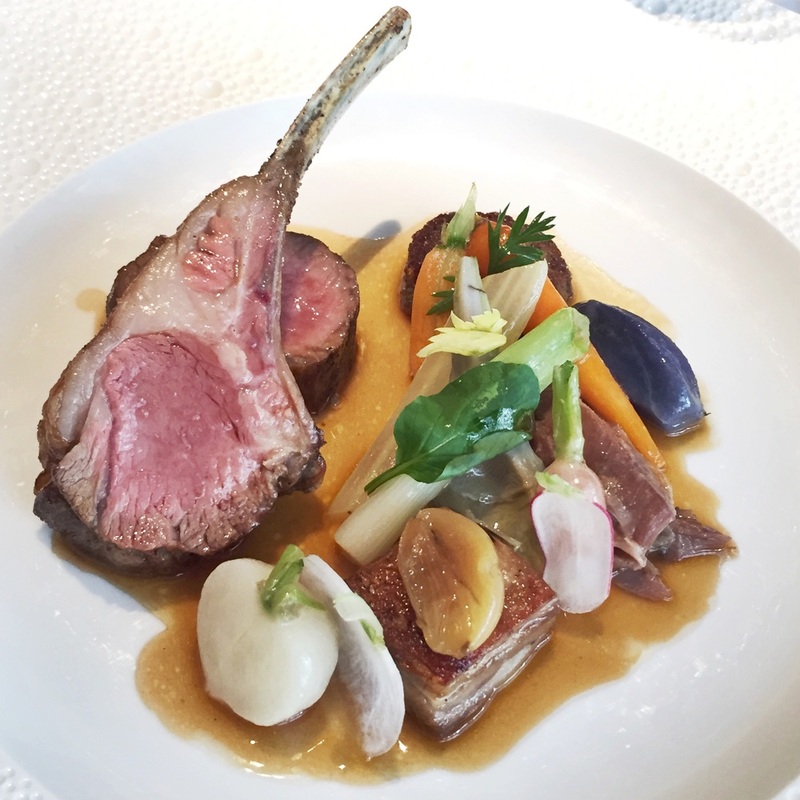 And for the final main course, we had Cotswold lamb with an autumn vegetable navarin. The lamb was prepared four ways, so we had two lamb cutlets, lamb breast, lamb shank and lamb shoulder. My favourite beyond favourite was the breast. It was so salty and tender, it just melted in your mouth. The vegetable navarin (french for stew) was light but fragrant. The violet potato (vitelotte) was such a cute touch! It tasted just like potato, but was purple!!! The lamb was cooked to perfection, and was definitely the best British lamb we've ever eaten. After the mains were finished, it was time to move on towards the sweeter end of the menu. 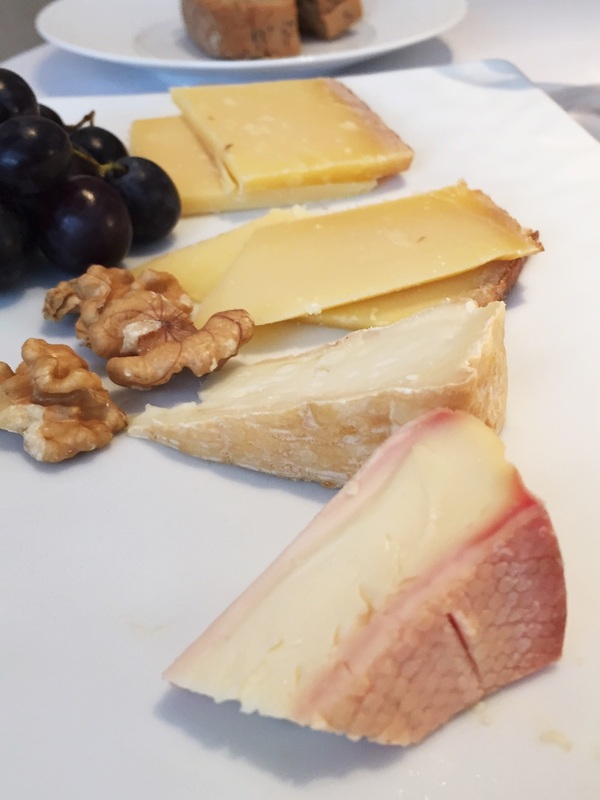 I opted for the cheese cart and whilst the soft cheeses were a little smelly for me, I LOVED the compte and salted cheddar. But I will say, I had order envy on this course! Pete selected the mango, jasmine and passionfruit "soup" which was amazing. The three flavours were so beautiful together. It was served at room temperature and drank with a straw, so whilst it wasn't really a soup, I'm not sure how else you would describe it!! Other than beautiful. Definite order envy. Afterwards, it was time to be put to work a little for the palate cleanser. We were each presented with a cold mortar and pestle, filled with freeze-dried herbs such as lemon verbena and mint. We had to grind this into a powder and then mix it through the cucumber sorbet. We had been feeling rather full at this point, but this was such a refreshing sorbet that completely refreshed the palate ready for some more indulgence! The combination of mint with the lemon verbena was literally like springtime in a bowl. Okay Chef, we are ready for more! Straight into Chef Clare Smyths' own signature dish. 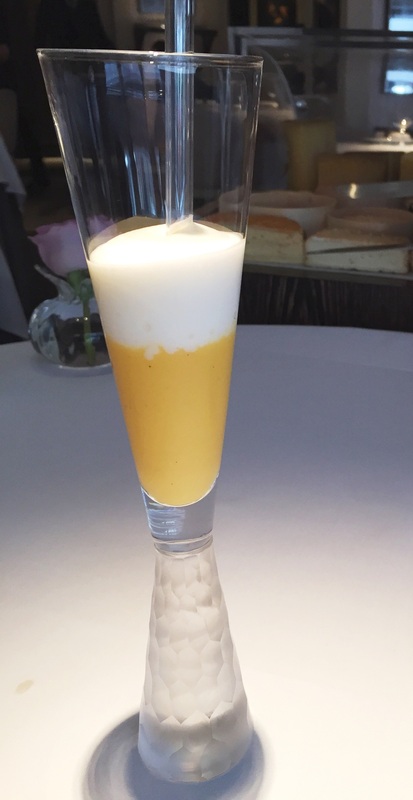 This beautiful creation is a lemonade parfait with honey, bergamot and sheeps' milk yoghurt sorbet. Encased by spun honeycomb. Naturally. I was so torn. If you've ever had ice cream in my company, you'll notice that I'm finished before you have even finished ordering yours. I cannot stand melted ice cream. Soft serve is fine, but it will virtually be inhaled. When I was presented with this dessert, it was so beautiful I didn't want to break it! I was taking photos, examining it from all angles and trying to figure out how on earth it was made. But, as I saw the first signs of melting sorbet, I just had to go for it. I was expecting it to be super sweet, but the preserved lemons brought the tang, and the honey wasn't overly sweet either. Quite simply, it was edible art. And worthy of being in a food museum. Our meal had come to an end and we were thoroughly impressed with it all. Whether you love or hate him (no guesses which camp I sit in!) 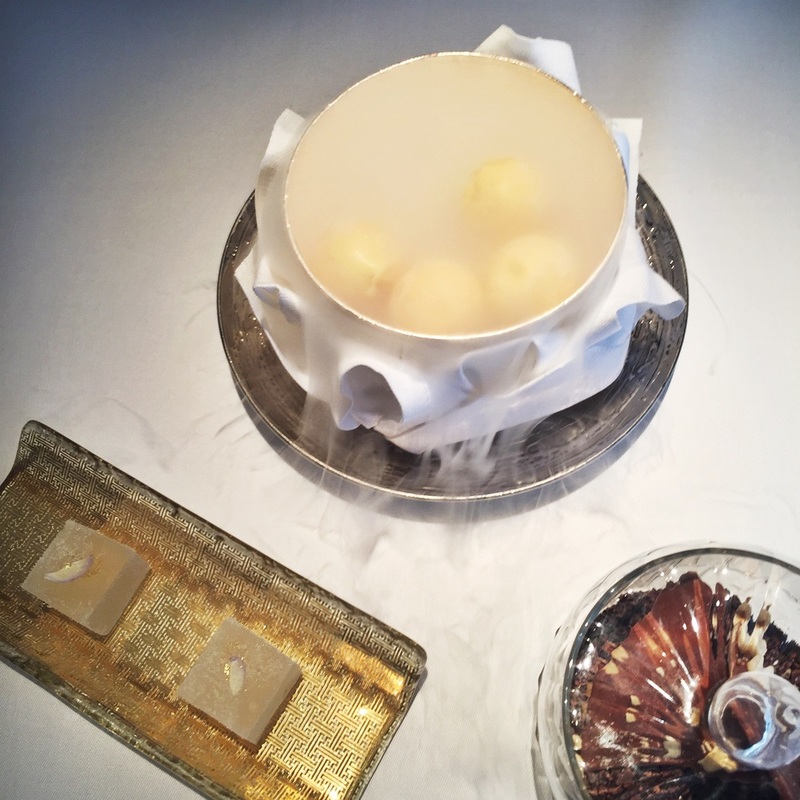 you cannot deny that Restaurant Gordon Ramsay has retained its 3 Michelin stars for a reason. Definitely not a meal if you're on a budget or time crunch, but for a special occasion indulgence, I wouldn't hesitate to go back! But next time, I will book a table for four, and hopefully Gordon and Clare Smyth will join us so I can pick their masterful brains about how all of this came to fruition!